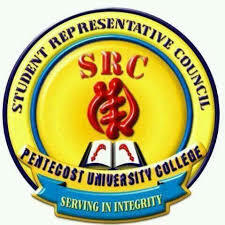 The SRC was formed in the year 2005 when the first sets of students were admitted into the University College. The SRC is the highest student leadership group. The group’s main aim is to champion the cause of students and liaise between the student body, the college administration and those outside the University Community. The SRC has sub-committees such as the Welfare, Judicial, Editorial, Disciplinary etc that handle issues relating to their specific areas. The sub-committees report to the Executive Council and the General Assembly. The latter is made up of presidents and heads of various clubs and associations and Faculty representatives. The General Assembly is the highest decision-making body of the SRC. Alswel Annan is the President of the Students’ Representative Council (SRC) of Pentecost University College. He is a Level 400 Weekend Student reading Communication Studies. He formerly served as the PRO and President of the Communication Studies Students’ Association of Pentecost University College. He is humble and welcoming. He believes in transparency and wishes to walk on the path in his tenure of office. Alswel has a strong desire to empower, counsel, lead and motivate others to unleash their potentials and fulfil their purpose. With the slogan, “Trust the process”, he urges all students to trust the process that will be put in place because he believes it will help achieve comfort for students. He is ever ready to serve the student body, and not to be served by students. Hannah Serwaa Boafo is the first female Vice President of the Students’ Representative Council (SRC). She is a Level 400 student reading Logistics and Supply Chain Management. She believes in empowering women to the highest office of leadership in any institution. She is optimistic; has a high sense of dignity and sees the best in everyone she encounters. Her hobbies are reading books on women empowerment and leadership, singing, dancing, soul winning and watching movies. Celestina Owusu Banahene is the Secretary of the Students’ Representative Council (SRC). She is a level 400 student studying Commerce. She is a great communicator (both written and verbal), with excellent interpersonal and leadership skills. She believes that coming to the table with good communication skills, media experience, professional office management skills, trained mechanism skills, certified customer service skills, accountability and innovative capabilities will help develop and boost the institutional performance. She agrees with the philosophy that a purposeful life can be lived by serving humanity in integrity. Jemima Abora-Darko is the Women’s Commissioner of the Students’ Representative Council (SRC) of Pentvars. She is reading Human Resource Management. She is a level 400 student who “would like to empower women on campus through the renewal of minds by helping them stay focus on a set goal, whether academically or vocationally. This will be done through an initiative called CREPP LADY which stands for Complete, Renewed, Empowered Purposeful/Prayerful”. She is very dependable with excellent interpersonal skills. She is willing to invest her time in the well-being of others. She loves to play Handball and was part of the PUC Female team that won the Gold medal in the 2018 PUSAG Games. Nicholas Addo Asiamah is the Financial Controller of the Students’ Representative Council (SRC) of PUC. He is a level 400 student reading Banking and Finance. He is action-oriented and has accountability and transparency as his hallmark. He is open to ideas and loves graphic designing, photography and digital painting. He believes that his multi-tasking, value-driven and results-oriented capabilities, not forgetting his God-fearing nature, will help him excel in this service.